Maybe it was because it was getaway day, maybe it was the hour and forty-seven minute rain delay, but the Cubs were seemingly ready to get out of Pittsburgh as fast as possible in this one. The Pirates jumped all over Edwin Jackson early as they scored twice in each of the first two innings, and that was plenty to silence the already quiet Cubs. 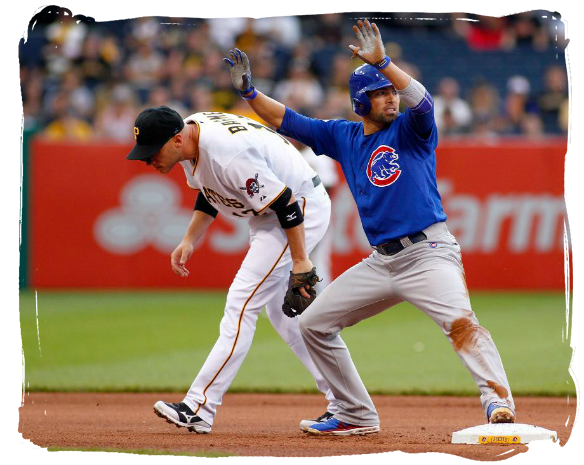 To the Cubs credit, they shut the Pirates down the rest of the way but once again couldn’t find enough offense. The Cubs were able to score once in the fourth and once in the seventh, but they couldn’t string together a rally, not even a fake one. For the series, the Cubs only scored six times and walk away with three straight losses. Not a great start to an eight game road trip as the Cubs now head to Cincinnati for a three game weekend series, this trip could end up disastrous. 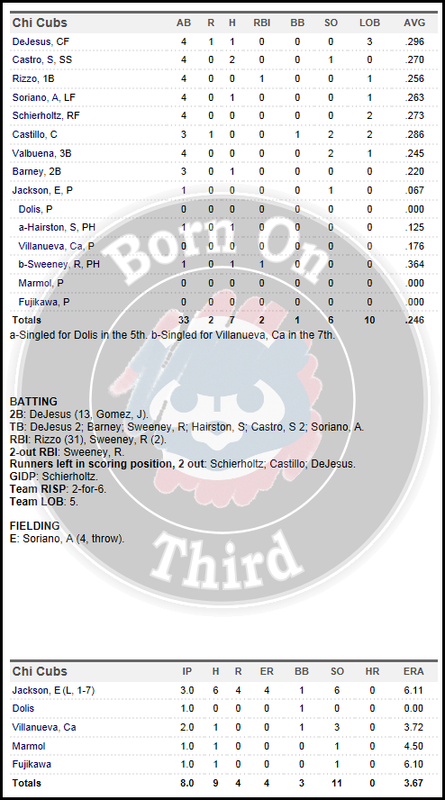 At The Plate – The Cubs could only manage seven hits in this one, and were 2-for-6 with runners in scoring position, so not a lot of chances all day. David DeJesus was back in the starting lineup and was 1-for-4 with a double, his thirteenth of the season. Starlin Castro was 2-for-4 with two singles in the loss to get his average back up to .270 on the season. Alfonso Soriano, Darwin Barney were the only other Cubs in the starting lineup to get hits, Scott Hairston and Ryan Sweeney added hits off the bench. On The Mound – Edwin Jackson had a rough go of it, then the rains game to end is day. Jackson worked three innings giving up four runs on six hits while walking one and striking out six, his record fell to 1-7 on the season. The Cubs pen was outstanding in this one, go figure. They worked a combined five scoreless innings giving up three hits while walking two and striking out five. Rafael Dolis, Carlos Villanueva, Carlos Marmol, and Kyuji Fujikawa were the ones that did the stellar work. Up Next – The Cubs travel to Cincinnati to take on the Reds this weekend, another stiff test. Series preview coming up shortly. A welcome sight to players and fans alike, the last game of spring training is here. The Cubs will battle the Brewers today at 2:05 PM Central, then break camp and head North for the start of the 2012 season. The bullpen decisions still loom as the Cubs most likely will not finalize their 25 man roster until tomorrow. Here is how the Cubs lineup today, Sveum wanted to go with his opening day lineup but LaHair was a late scratch with a stiff back which has plagued him for the last few days. Travis Wood takes the ball before heading to Iowa. We preview the first series of the year against the Nationals tonight or tomorrow, check back later on. The Cubs continue to wind down the spring today as they face the Diamondbacks in Scottsdale at 3:05 PM Central. Jay Jackson takes the ball today, while Jeff Samardzija tuned up for the regular season at Minor League camp. Here’s how the Cubs will line up. Last day of March, opening day is inching closer. The Cubs face off against a familiar foe this afternoon, Albert Pujols, he is in the lineup and batting third. should be a good test for Maholm today, the game is at 3:05 PM Central, and is on Comcast Sports Net today. As promised, Dale Sveum, Theo Epstein, and Jed Hoyer sat down after yesterday’s 2-0 victory over the Indians and hammered out the Cubs 25 man roster, or at least most of it. Notes: Big, big roster decisions coming today, the Cubs brass will get together after the game today and all but finalize the 25 man roster. Sveum wants to treat the last 5 games or so as regular season games, so the roster needs to be set. Once it is set we will have all the info for you here on the blog so check back. The Cubs exploded with the long ball in the 9th inning yesterday to beat the Reds 7-4. The Cubs entered the 9th inning tied at three, Welington Castillo led the 9th of with a HR, and Dave Sappelt rocked his former club with what turned out to be the game winning three run homer. Darwin Barney also chipped in with three hits on the afternoon. Notes: The Cubs signed reliever Shawn Camp from the Seattle Mariners yesterday. Camp was more than serviceable with the Blue Jays last year, I wasn’t the only one surprised about him being released, he was too “I was a little surprised,” Camp said about being released. “I was having a good spring, came in on a Major League deal. They decided to go in a different direction. They decided to go with youth. For me, it was kind of a shock. To tell you the truth, it doesn’t surprise me. Trevor Miller was released by the Cubs as well, the 38 year old really didn’t have a spot in this organization once it was clear he wasn’t making the team. The Cubs split a pair of games yesterday, winning 2-0 against the Padres and falling 3-2 to the Diamondbacks, tremendous effort from the Cubs arms yesterday.